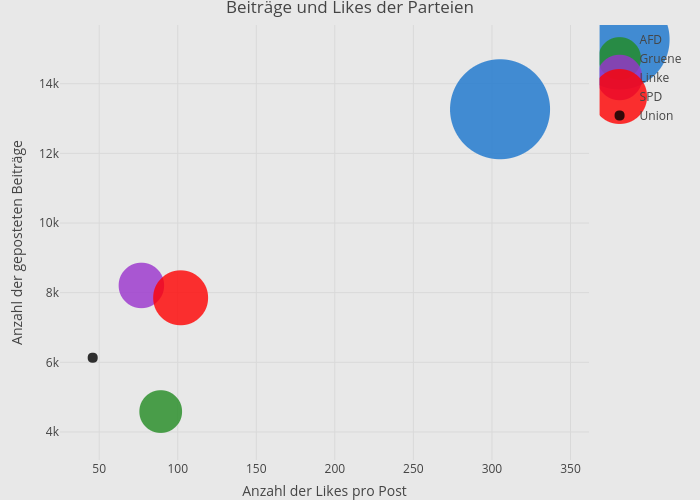 Kailicht's interactive graph and data of "Beiträge und Likes der Parteien" is a scatter chart, showing AFD, Gruene, Linke, SPD, Union; with Anzahl der Likes pro Post in the x-axis and Anzahl der geposteten Beiträge in the y-axis.. The x-axis shows values from 29.637363259656095 to 331.575788314972. The y-axis shows values from 3758.3794897924363 to 14485.382372140557.